To Cite: Nasiri E, Pourghasem M, Moladoust H. The Prevalence of Absence of the Palmaris Longus Muscle Tendon in the North of Iran: A Comparative Study, Iran Red Crescent Med J. 2016 ; 18(3):e22465. doi: 10.5812/ircmj.22465. Background: The palmaris longus is a degenerating weak flexor muscle in the anterior of the forearm. Many techniques for clinically determining the presence of the palmaris longus have been described. Ethnic variations in the prevalence of the absence of the palmaris longus are well known. Objectives: This study considered the prevalence of absence of the palmaris longus muscle tendon in the north of Iran. Patients and Methods: The presence of the palmaris longus was clinically determined in 562 men and women from the Guilan population, using the standard technique (Schaeffer’s test). In subjects with an absent palmaris longus, three other tests (Thompson, Pushpakumar and Mishra tests) were performed to confirm the absence. Results: The overall prevalence of right, left, bilateral and total absence of the palmaris longus were 4.1%, 5.2%, 3.9% and 13.2%, respectively. There was no significant difference in its absence with regard to the body side or gender (P > 0.05). Conclusions: This study demonstrated that the presence of the palmaris longus muscle tendon in the Guilan population was considerably higher than the absence of the palmaris longus tendon. The overall prevalence of right, left, bilateral and total absence of the palmaris longus was not significantly different between men and women. The prevalence of the left-absent palmaris longus was more common in the present study. The palmaris longus muscle is one of the flexor muscles of the forearm that originates from the medial epicondyle of the humerus, terminates on the flexor retinaculum and contributes to the palmar fascia. The role of this muscle is to help with wrist flexion. The palmaris longus muscle is one of the most variable muscles of the body. Although in the upper limbs its function is considered insignificant, in the event of tendon grafting, it is considerably important. In the anatomical and surgical texts, occurrence of absence of the said muscle is reported to be about 15% (1, 2). But this prevalence level may not be an indicator for all the world populations. In most races, variation of the occurrence of absence of the palmaris longus muscle has been reported (3). Karimi-Jashni et al. 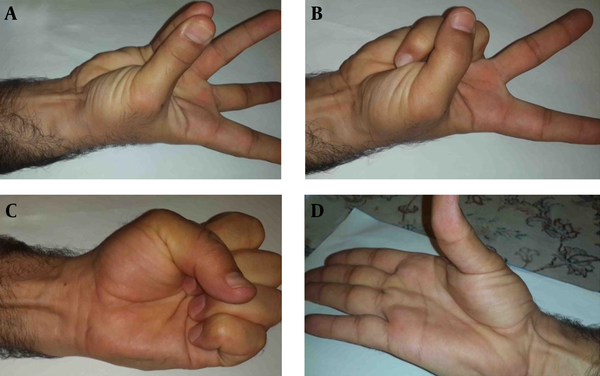 reported the prevalence of absence of the palmaris longus muscle (30.7%) in the south of Iran (4). In another study, the prevalence of palmaris longus muscle agenesis in Tehran (the capital of Iran) was reported as 22.8% in medical students (5), and in an additional study this prevalence was reported as 21.0% in patients referred to one health center (6). However, no report has been presented in relation to the occurrence of absence of palmaris longus muscle in north of Iran. Therefore, considering the importance of providing anatomic data that could serve to enhance clinical applications, the aim of this study is to determine the prevalence of agenesis of the palmaris longus muscle and its association with gender in the Guilan population in the north of Iran. This study was performed on 1,124 upper limbs in 562 consecutive outpatients of the orthopedic ward of Poursina hospital in Rasht. The patients, who had a record of surgery, abnormality and inborn deformation of the upper limbs, and also children under the age of 10, were excluded. For examining the palmaris longus muscle tendon, standard clinical methods were used. After explaining the study aim to the patients, they were asked to lay their thumb against their little finger and at the same time flex their wrist (Schaeffer’s test). In this state, the palmaris longus muscle tendon in the front of the wrist will be raised under the skin (Figure 1A). If in this test the tendon is not observable or touchable, other tests such as Pushpakumar’s test (Figure 1B), Thomson’s test (Figure 1C) and Mishra’s test II (Figure 1D) (7-10) were used for confirmation of the muscle absence. With these methods, existence or absence of the palmaris longus muscle tendon in the two upper limbs were registered. In this study, occurrence of absence of the palmaris longus muscle tendon in men and women, and symmetry of the right and left side were considered. All statistical analyses were performed using SPSS version 16 (SPSS Inc., USA). The categorical variables were compared using the Chi-squared test. A P Value of < 0.05 was considered statistically significant. Informed consent was obtained from each patient included in the study, and the study protocol conformed to the ethical guidelines of the 1975 declaration of Helsinki. A total of 562 subjects were included in the study. There were 281 male and 281 female subjects. The age of the patients ranged from 15 to 70 year old; the average age being 35 years. The overall prevalence of palmaris longus agenesis, according to gender and limb results, is summarized in Table 1. Out of a total of 562 patients examined, at least one palmaris longus tendon was present in 540 patients (96.1%), and both the tendons were present in 488 (86.8%). Out of those with unilateral agenesis, 29 (5.2%) had left-sided agenesis and 23 (4.1%) had right-sided agenesis. Hence, agenesis was seen more commonly on the left side than on the right, and the difference was statistically significant (P < 0.001). On the whole, female subjects had a prevalence of agenesis of the palmaris longus tendon (unilateral and bilateral combined) of 36 out of 281 (12.8%), while in male subjects this prevalence was 38 out of 281 (13.5%). The difference was not statistically significant (P = 0.803). Although the proportions of patients with unilateral and bilateral agenesis were comparable (22 patients or 3.9% had bilateral agenesis and 52 patients or 9.3% had unilateral agenesis, p=0.759), the pattern of agenesis of the palmaris longus was different in the two genders. In male subjects, 26 (68.4%) were unilateral, compared to 12 (31.6%) who were bilateral (P = 0.076). Female subjects had unilateral absence of the palmaris longus more commonly; 26 (72.2%) were unilateral, compared to 10 (27.8%) who were bilateral (P = 0.040). This implies that there is a 31.6% probability of a male subject with one-sided agenesis to have agenesis on the opposite side as well. In contrast, if the palmaris longus tendon in a female subject is absent on one side, there is a 27.8% chance that it will also be absent on the other side. The palmaris longus is considered one of the superficial flexor muscles of the forearm and one of the most variable muscles of the body. Most researchers consider this muscle equivalent to the plantaris muscle in the lower limbs. The palmaris longus muscle is well developed in the animal species, which tolerates more weight on the upper limbs than other species. But in the human species, in which the role of the upper limbs in toleration of body weight has been decreased, the palmaris longus muscle is less developed and uncompleted (11). Despite the fact that this muscle exists in humans, its role in hand function is decreased, and in most cases of limb surgery it is used as a tendon graft (12). Various studies have shown that absence of the palmaris longus muscle will create no disorder in hand function; therefore, in necessary cases, the tendon of this muscle is used in tendon grafting without fear that patients will have decreased ability to clench their fist or perform other hand functions. The ability to estimate palmaris longus muscle absence in different population groups is an added value to most surgeons around the globe, wherever they are increasingly dealing with patients of different ethnic backgrounds. Compared with the other muscles, because of its unique specifications including length and raised nature, the palmaris longus muscle tendon is well observable and available and has been studied by researchers more frequently than others (13). Absence of the palmaris longus muscle has been the subject of studies performed by many researchers in living and deceased people, and the occurrence percentage was variable in different populations and races. In the current research, absence of the palmaris longus muscle, both unilaterally and bilaterally, in the Guilan population in the north of Iran has been studied. In addition, the prevalence of absence of the muscle was compared between the two genders. In this study, the overall prevalence of absence of the palmaris longus muscle was 13.2%, which was lower than three studies performed by Karimi et al. (4) (13.2% vs. 30.7%, P < 0.001), Ashouri et al. (5) (13.2% vs. 22.8%, P < 0.001) and Kamrani et al. (6) (13.2% vs. 21%, P = 0.002) in Iran (3-5). Compared to other studies, the prevalence of palmaris longus absence in Serbia (22.4% and 37.5% in two studies (14,15)), America (25.0%, (16)), Turkey (26.6%, (17)), India (17.2% to 28.0% in three studies in Indian population (7, 18, 19)) and Bahrain (36.4%, (20)) was higher than our result. Other studies showed a lower value such as 1.5% in Zimbabwe (21), 4.1% in Korea (22), 5.5% in Japanese subjects (23), 6% in Chinese subjects (3), 7.1% in Native American subjects (1), 11.3% in Malaysia (13) and 11.5% in a South African population (24). Therefore, it can be said that the study of one population cannot be considered for another population, and absence of the palmaris longus muscle is dependent on race (3, 25). Most researchers reported occurrence of palmaris longus absence in women more than in men and in the left side more than in the right side (13). But our findings showed absence of the palmaris longus muscle in men was not significantly higher than in women (51.4% vs. 48.6%, P > 0.05), and in the left side was not-significantly higher than in the right side (5.2% vs. 4.1%, P > 0.05). Also, there was not a significant difference between the two genders in most previous studies, which is concordant with our findings (Table 1). One limitation of our study was that the presence of a palmaris longus muscle (left, right and bilateral existence) was determined by clinical exam, which can be examiner dependent, rather than cadaveric dissection. To mitigate this issue, we used four different tests to detect the palmaris longus muscle. The authors wish to thank all staff of the orthopedic ward of Poursina Hospital in Rasht involved in this study. Authors’ Contribution: Study concept, design and study supervision: Ebrahim Nasiri; analysis and interpretation of data, drafting and revision of the manuscript and statistical analysis: Hassan Moladoust; acquisition of data and critical revision of the manuscript for important intellectual content: Ebrahim Nasiri and Mohsen Pourghasem. Funding/Support: This research was funded in part by the vice-chancellor of research at Guilan University of Medical Sciences.